Our family saves so much money by making our own laundry soap. I encourage you all to try it at least once! The girls help me make it and we all enjoy that time together. The process is much easier than I thought it would be, and much cheaper than I thought it would be, too. All of the ingredients cost less than $10.00 at Walmart, and the amounts needed for one 10-gallon recipe cost less than $2.00. The time it takes us to assemble it all is probably less than 15 minutes. What a deal! Disclaimer/Please Learn From My Mistakes/Warning: We picked up a pickle bucket from a local pizzeria. Unless you like the smell of dill pickles, you might want to go with a different smelling bucket than we did. Our bucket of soap literally smells like soapy pickles. But thankfully, our clothes do not. You can always add essential oils to your soap to make it smell even nicer. If any of you use oils to scent your soap, please let me know which scent you use. I'd love to try, just not sure which one to use. -Add 4 cups hot tap water to pot on stove over medium-low heat. - Grate bar of soap and add to pot with water. -Stir continually over medium-low heat until soap dissolves and is melted. -Fill a 5 gallon bucket half full of hot tap water. -Add melted soap, washing soda and Borax to bucket. -Stir well until all powder is dissolved. -Fill bucket to top with more hot water. -Stir, cover and let sit overnight to thicken. -The next day, stir and fill a used, clean, laundry soap dispenser half full with soap and then fill rest of way with water. Optional: You can add 15 drops of essential oil per 2 gallons once soap has cooled. 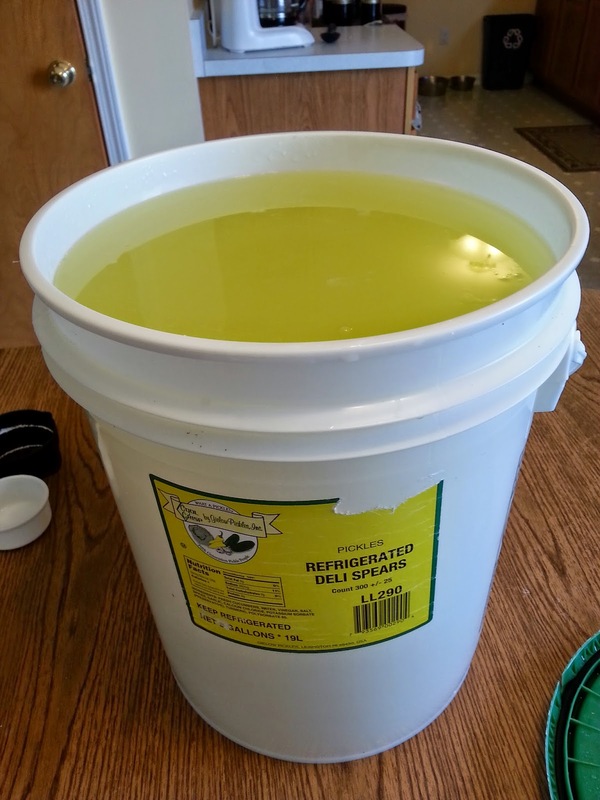 Recipe will yield 10 gallons of liquid laundry soap. Here is our video that goes through the whole process. I encourage you all to give it a try!